Learn the basics of the Irish language or Gaeilge in the home. 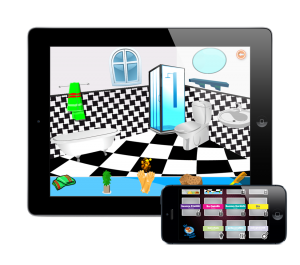 The app allows the user to explore 7 rooms in a virtual house, where each room contains tasks and fun challenges. This early version of the game features only 2 levels. By using a drag and drop approach to learning the user gets to experience the voice of a fluent speaker who helps guide them and figure out puzzles. It’s easy to just drag and drop items from the menu, you will hear a voice command. This will tell you where to put the item. This is an intuitive application, and it has been developed with help from a local school with 30+ children helping develop the apps creative functionality. The game works on a single touch and drag method, so don’t forget to turn on your speakers. Foghlaim bunús na Gaeilge sa bhaile. Leis an bhfeidhmchlár seo is féidir leis an úsáideoir aithne a chur ar 7 seomra i dteach fíorúil, le tascanna agus dúshláin spraoiúla i ngach seomra. Níl ach dhá leibhéal sa leagan luath seo den chluiche. Trí mhíreanna a tharraingt agus a scaoileadh faigheann an t-úsáideoir taithí ar ghuth chainteora ó dhúchas a bhíonn á dtreorú chun na tomhais a réiteach. Tá sé éasca míreanna a tharraingt agus a scaoileadh ón roghachlár agus nuair a dhéanann tú é sin inseoidh an guth duit cén áit is ceart an mhír a chur. Feidhmchlár iomasach is ea é seo, a forbraíodh i seomra ranga beo le 30+ leanbh chun treo cruthaíoch an fheidhmchláir a stiúradh. Feidhmíonn an cluiche ar mhodh singil ‘teagmhaigh agus tarraing’, agus ní mór do na callairí a bheith ar siúl. Its a great app but you its only the first room that is free you have to pay for some content, but once you paid for it it is worth it, there should be more room it took us 1 hour to complete the game and this was great fun and I think my whole family learned alot more words through this than we ever did using book, just get it finished. Thank you this makes my kids think learning irish is cool again, been playing away with it all day. Please release the other rooms soon. IS it always gonna be free?